Now the fun begins for the West Linn girls basketball team. The fourth-ranked Lions open play in the 2019 Class 6A state tournament at 3:15 p.m. Thursday when they face No. 5 Beaverton at the Chiles Center on the University of Portland campus. Needless to say, West Linn's players are as excited as they could be for the team's second straight tournament appearance. In 2018, the Lions played their way to third place at state. "We worked really hard for this," said West Linn post Vanessa Viuhkola, a 5-foot-11 junior. "It's just like icing on the cake. We worked so hard all summer so this is a good way to go out." 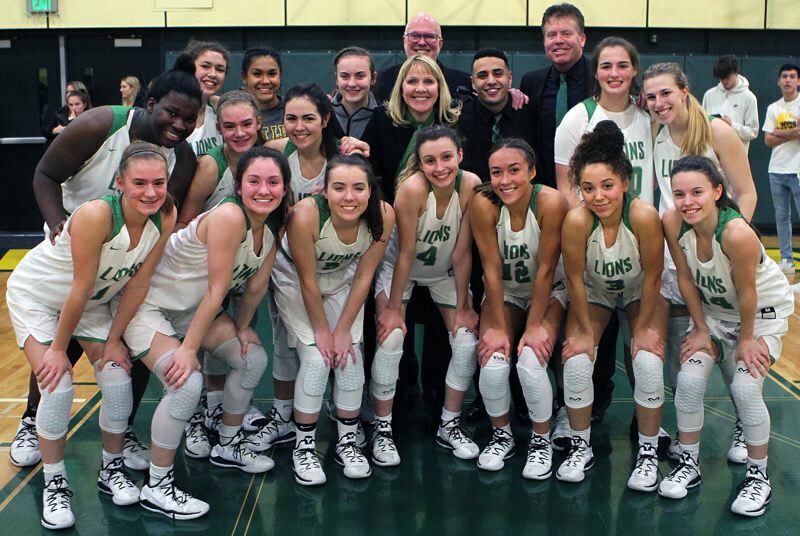 That said, the Lions know just how big a challenge they face, beginning with the first game against Beaverton (17-10 overall), the second-place team from the Metro League and a team that beat West Linn 63-48 in the PIL Holiday Classic on Dec. 27. "It's definitely going to be a challenge, but we'll come out with the same energy we had (in the second playoff round against Central Catholic) and I think we'll finish," said Aaronette Vonleh, a 6-foot-4 sophomore post who won first-team all-Three Rivers League honors after leading the Lions in scoring at 18.5 points per game and rebounding with 6.8 per game. "They shot the ball really well (in the December contest). They're a really good team," said 5-7 sophomore guard Payton Shelstad, an honorable mention all-TRL pick who averages 6.6 points, 4.3 rebounds, 2.6 steals and 2.2 assists per game. "It's going to be a really great battle, but I think we're capable of winning." In addition to Vonleh, Viuhkola and Shelstad, the Lions look to: 5-8 sophomore point guard Cami Fulcher, a second-team pick who averages 6 points, 3.4 rebounds and 4.2 assists per game; 5-9 sophomore guard Audrey Roden, a second-team selection who averages 14 points, 5.8 rebounds and 3.3 steals per game; 5-9 junior wing Elisabeth Dombrow; 5-5 senior guard Katie Schoenborn; and 5-10 senior post Riley Drullinger. "We are a really close group and just getting there is huge," Viuhkola said. "There's eight teams … and they're all really good and we all have a shot at winning so it's going to be a really tough tournament, but I think we're ready." The Lions, who finished tied for second in the TRL race, believe that their depth and camaraderie will pay big dividends at state. "It's not just five starters who stay in the whole time — anyone can come off the bench and do amazing things," Vonleh said. "We've grown so much from the beginning of the season," Viuhkola added. "We've really grown into a better team; we're a lot stronger and more confident in ourselves." The other quarterfinal match-ups at the tournament include: No. 8 South Medford (23-4 overall) vs. No. 1 Southridge (23-3), 1:30 p.m. Thursday; No. 6 Jesuit (21-5 overall) vs. No. 3 Benson (23-4), 6:30 p.m. Thursday; and No. 7 Sheldon (23-4 overall) vs. No. 2 Tigard (24-3), 8:15 p.m. Thursday. The tournament semifinals are scheduled for 6:30 p.m. and 8:15 p.m. Friday, and the tournament championship for 8:30 p.m. Saturday.